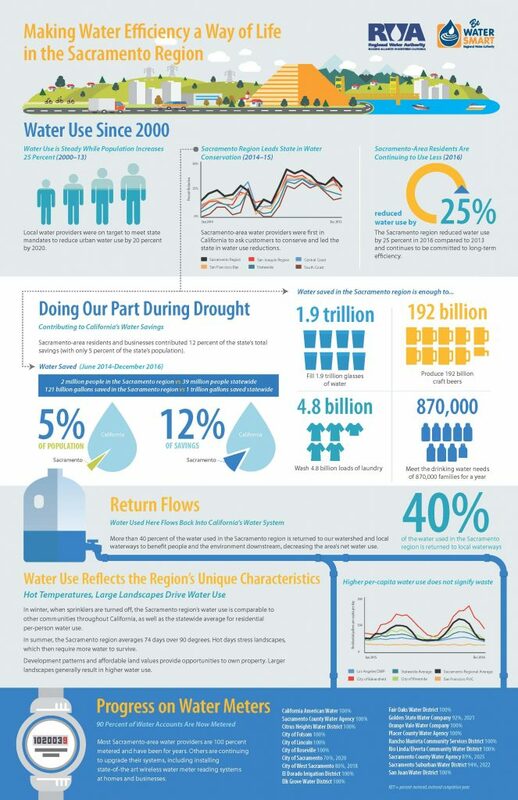 As part of the Water Forum agreement signed in 2000, each water provider in the region committed to implementing a comprehensive water efficiency plan. More than a decade later, water providers are dedicated to continuing to make water efficiency a way of life in the Sacramento region. Before the drought, in fact, water use in the Sacramento region remained steady despite a 25 percent increase in population. During the drought, Sacramento-area water providers were first in California to ask customers to conserve and led the state in water use reductions. Local residents and businesses did their part by contributing 12 percent of the state’s total savings (with only 5 percent of the state’s total population). The primary factor that drives water use in the Sacramento region are summer’s hot temperatures and large landscapes (not waste). In winter, when sprinklers are turned off, the region’s water use is comparable to other communities throughout California, as well as the statewide average for residential per-person water use. 94 percent of water accounts in the Sacramento region are now metered. In the Sacramento region, water meters are critical tools for managing supplies. Most water providers are 100 percent metered and have been for years. Others are continuing to upgrade their systems, including installing state-of-the art wireless water meter reading systems at homes and businesses. Automated meter infrastructure (AMI) provides real-time water use information, which helps water managers and customers understand how, when and why water is used. AMI technology also helps pinpoint leaks by immediately flagging unusual use so that repairs and adjustments can be made quickly. Water providers in the region have been leaders in the development of alternative water supplies. Some now meet more than 10 percent of overall demand through recycled water, including leading the nation in the use of recycled water for residential landscape irrigation. Others have developed innovative agreements to put remediated groundwater from contaminated plumes to beneficial uses to offset the use of potable water. More than 40 percent of the water used in the Sacramento region is returned to the local watershed and waterways to benefit people and the environment downstream, decreasing the area’s net water use.